Let’s talk about getting your vegetable and flower beds ready for planting by preparing the soil. No matter how great your soil seems to be, your new plants will welcome a boost of vital nutrients. Tomatoes, onions, peppers and other vegetables are known as “heavy feeders”. This means they need (and therefore remove) lots of minerals from the soil they grow in. Without fertile soil many plants will struggle to produce those tasty fruits and vegetables, and beautiful blooms. 1. 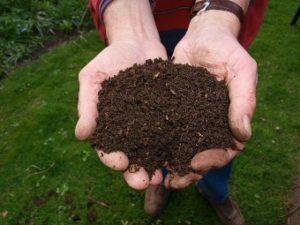 Add compost: Make your own or purchase a quality one such as mushroom compost. You may also like chicken manure based, beer industry bi-products or even dairy cow manure. Avoid compost made from curbside recycling (who knows what is really in there) or anything with steer manure, usually very high in salt. Spend a little extra on better quality and your garden will thank you with beautiful vegetables and flowers. 2. Use fertilizers: A mild, organic fertilizer is best and can range from fish emulsion to compost tea or kelp. Seek out a liquid fertilizer that is a balanced mix of nitrogen, phosphorus and potassium. Look for a label with low numbers for each of these 3 minerals. See below for example (3-3-2). 3. Cover the soil all year: Use mulch (shredded leaves are perfect) and cover crops when you are not growing vegetables. This will help keep weeds at bay and adds nutrients to the soil. 4. Rotate vegetables: Don’t grow the same vegetables in the same place every year, especially those “heavy feeders” (mentioned above). It’s best to give the soil a three-year break between them to avoid diseases and soil depletion. Remember that some crops (peas and beans in particular) actually add nutrients to the soil they are grown in. 5. Encourage worms: Worm castings are expensive but have such great qualities that even a little bit is well worth it. The more you amend your soil over time, the better it becomes and somehow worms find their way to worthy soil.